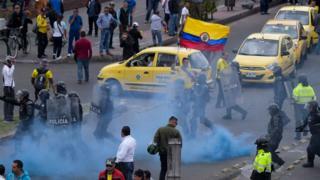 Thousands of taxi drivers in the Colombian capital Bogota have blocked roads and clashed with police in protest at hail services such as Uber. Yellow cabs lined the streets of the city on Monday as drivers objected to what they said was an unfair advantage awarded to app-based services. The protesters are calling for more regulation on technology companies like Uber and Cabify, who they say are not obliged to pay insurance. The strike caused major disruption. Cab drivers blocked major intersections in the capital. As protesters began attacking those who refused to join the strike, police threw tear gas at the crowd to disperse them, Reuters news agency reports. "We want the government to stop Uber, Cabify and any other applications that try to come here," said taxi driver William Trivino, 38. However, authorities in Colombia have said that they are unable to prevent start-ups like Uber and Cabify from operating in the city. It comes after a government decision to force drivers to replace taxi meters with GPS-based software applications that can be used to calculate and collect fares. Drivers argue that the technology is expensive and makes them more vulnerable to theft. Demonstrators are also protesting against the city's recent drive to offer on its roads preferential lanes for buses and bikes. There are more than 50,000 registered taxis in Bogota, which is home to about eight million people.